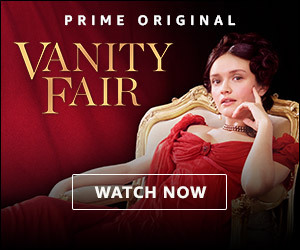 The trend of making books into popular television shows (see more bookish television shows) continues with ITV/Amazon's Vanity Fair. Based on the Victorian classic of the same name by William Makepeace Thackeray, it is now streaming on Amazon Prime Video. It has been popping up on my to watch list for a while but it wasn't until recently that I decided to watch it. Television is a bit slow right now and it seemed like a good to watch. 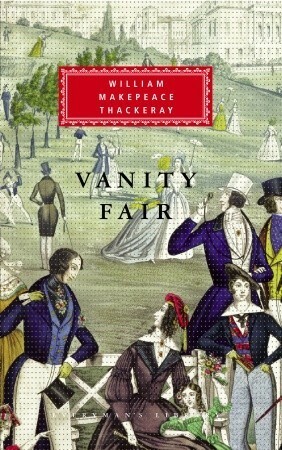 Vanity Fair the book which was first published in serial form (19 volumes) in 1847 to 1848. It was published as a novel in 1848. Depending on the edition the book is between 700 and 900 pages long. Yet the show is only 7 episodes long (less than a total 7 hours of air time). Needless to say, big chunks had to be cut from the book. I have not read the book, even if I liked Victorian era novels the 900 pages would have been a deterrent. So I can't really compare the book to the show, but Radio Times has a nice article. For me, the show was okay. It wasn't something I rushed back to watch, but it was interesting enough to fill in the slow periods in my viewing schedule. The main character, Becky Sharp, reminded me a bit of Jane Eyre, though Jane was never so conniving as Miss Sharp. It was the humble beginnings that they both came from: orphaned as a child and then being sent to be a governess. A novel that chronicles the lives of two women who could not be more different: Becky Sharp, an orphan whose only resources are her vast ambitions, her native wit, and her loose morals; and her schoolmate Amelia Sedley, a typically naive Victorian heroine, the pampered daughter of a wealthy family. I think what I liked the most about the show was the opening sequence which is narrated by Thackeray. After discovering on Wikipedia where Thackeray got the title for the novel, the introduction makes even more sense. The title is taken from Pilgrim's Progress by Paul Bunyon. It is a reference to the town of Vanity where there is a never-ending fair. In Pilgrim's Progress, it symbolizes man's obsession with worldly possessions. It is the same point that Thackeray satirizes in his story. I really liked the clothes, the sets, and just the theatrics of the show. So while the storyline was sometimes uninteresting to me, the production kept me coming back. I was also curious how things turned out for Becky. For some reason, I couldn't help but hope she got the happy ending she was endlessly looking for. This isn't the first time Vanity Fair has been adapted. In 1911, it was adapted for the first time as a silent film. It would get 3 more incarnations as a silent film before it was filmed with sound in 1932. Its most recent film adaptation was in 2004 which starred Reese Witherspoon as Becky Sharp. It was adapted to the small screen 6 times before this most current adaptation. All the previous versions, except for the Russian one, were BBC series. The 1967 version aired on PBS's Masterpiece Theatre in 1972 and for which actress Susan Hampshire won an Emmy in 1973 for her portrayal of Becky Sharp. Vanity Fair (the novel) is often considered the principal novel that established Victorian domestic fiction. So if you are looking for historical women's fiction, you might want to check this novel out. If you want to get a sense of the novel before committing to reading nearly 900 pages, then check out the show on Amazon. If you have read or watched Vanity Fair, I would love to hear your thoughts. Congrats on the book and TV show.